April Fool’s Day, a holiday dedicated to all things phony, is a great time to explore the Village, where many of the stories linked to famous former residents are, alas, pure hokum. Right now, many buildings on the sales and rental markets in Greenwich Village — and its adjacent West and East Villages — come with such claims to historic glory. Further scrutiny, however, charmingly debunks the majority of these professed ties. A few tales are oft repeated: the twin houses built by a ship captain for his feuding daughters, or the place where Edgar Allan Poe saw his doctor for a cold. If you believe tour guides and brokers, you could rent an apartment in the very home where John Wilkes Booth planned Abraham Lincoln’s assassination — or purchase the speakeasy where they’d yell “86 it!” to send imbibing customers scurrying out the back door during a Prohibition-era raid. These stories often start with grains of truth and grow into myths that bear little relation to facts. Still, if sellers and buyers, and landlords and brokers, are content with embellishment in the name of lively cocktail-party banter, there might not be any harm in believing the exaggerations. Let’s start with that famous speakeasy, Chumley’s, at 86 Bedford St. Established in 1928 by Leland Chumley, a radical and a member of the International Workers of the World (or “Wobblies”), the bar — like most others during Prohibition — had no sign or indication it served alcohol. The front entrance was hidden in a courtyard on Barrow Street; the nondescript house door on Bedford was the escape route, complete with a tricky set of stairs that Chumley installed to trip up the police during a raid. So far, so good. But did the bartenders really yell out “86 it!” — indicating the back door’s address — when patrons had to flee, creating the slang that means to get rid of something? Unfortunately, as linguistic sleuth Barry Popick discovered, the phrase was likely used by restaurants before Chumley’s even existed. If there’s a connection, it’s at best a coincidence. But that doesn’t mean the building isn’t soaked in decades of stories that are probably true, from Edna St. Vincent Millay tending bar to F. Scott Fitzgerald sleeping it off in a corner booth. Above the bar, Chumley ran a secret meeting place for fellow radicals (supposedly his fellow Wobblies would be hoisted up via dumbwaiter to avoid detection) where he also published political pamphlets. 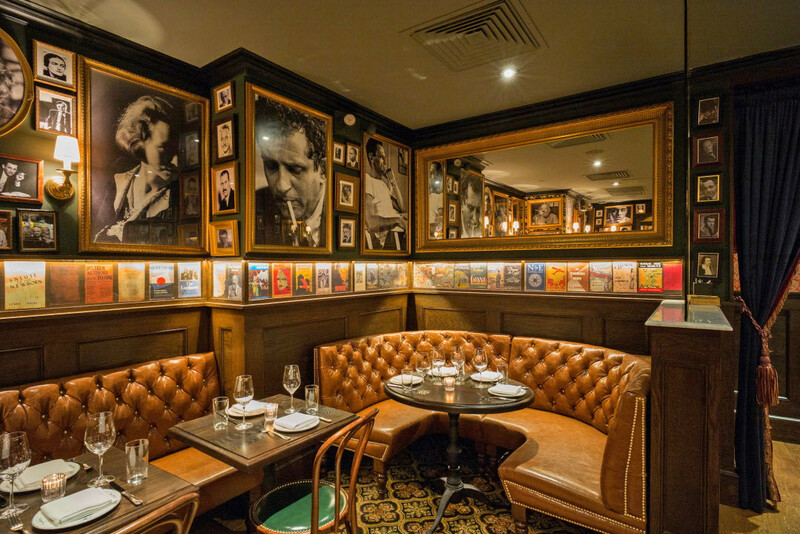 In October, restaurateur Alessandro Borgognone reopened the speakeasy after a major renovation. Then, in late February, the entire building hit the market for $12.75 million, courtesy of David Schechtman with Meridian Capital Group. The former meeting place upstairs has been converted into a lovely two-bedroom, 2½-bathroom duplex — though arrival via dumbwaiter is no longer an option. A successful buyer would be Chumley’s landlord. Walk around the corner to 45 Grove Street and you’ll find the 1830 Federal-style former home of Revolutionary War hero Samuel Whittemore, which was expanded later in the 19th century, first as a hospital and then as a boarding house. For years, tales have circulated about how crucial this place was to John Wilkes Booth’s plan to assassinate Abraham Lincoln. What’s true is that Booth did approach a resident there, Samuel K. Chester, and tried to engage Chester in what was then a mere kidnapping plot. Though Chester turned Booth down, that hasn’t stopped everyone — from tour guides to PBS’s “History Detectives” — from snooping around looking for a link to one of America’s most shocking murders. Today, the building’s 15 charming apartments rent for between about $2,800 and $5,500 a month — but the chances are much greater that a wounded soldier once bunked in your space, not an infamous assassin. In fact, there are a lot of boldface names attached to properties in the Village who didn’t actually live there. For years both Cary Grant and John Barrymore have been linked to 75½ Bedford Street, the city’s narrowest house — which sold in 2013 for $3.25 million — but there’s no evidence either man stayed there. Also, the plaque on the front of the building that says Edna St. Vincent Millay wrote her Pulitzer Prize-winning poetry there isn’t true, though at least Millay did live in the home, adding its charming Dutch stepped gable. 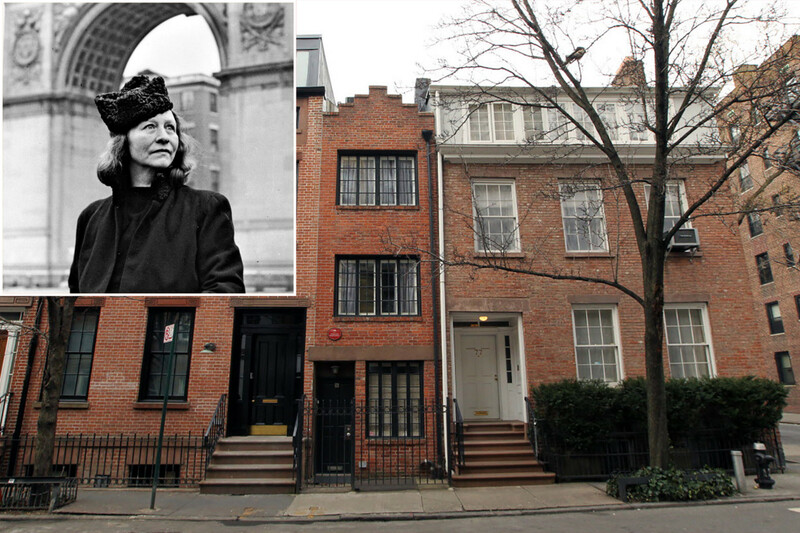 Millay came to the home via the nearby Cherry Lane Theater, which owned the building. There’s a very official-looking plaque set on the wall at the corner of Commerce and Bedford streets describing the colonial history of Cherry Lane — but that’s apocryphal, too. No such street ever existed, and the story was likely invented by the theater to lend an air of historic credibility to their project. Another apartment building with units currently on the market is 102 Bedford St., an eclectic half-timbered building that looks like something from a fairy tale. 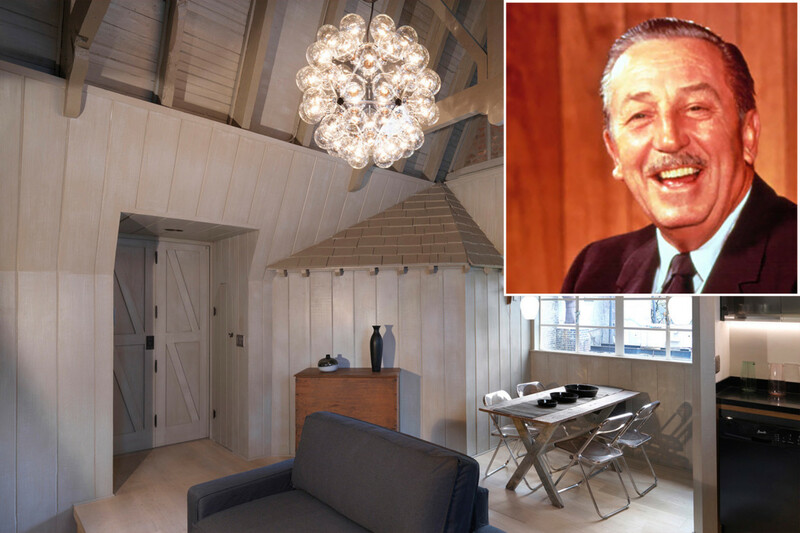 Maybe that’s why one name frequently attached to the address is Walt Disney, who is said to have rented there. Units up for rent range from $2,900 for a cute studio to $5,750 for a one-bedroom penthouse unit. But despite their quirky charm, alas, none of them is Walt’s former abode. “Seeking New York” author Tom Miller calls the chance of Disney living in the building “unlikely” — and that assessment probably goes for rumored resident celebrities Douglas Fairbanks and Cary Grant, too. Perhaps the most famous name associated with the Village is Edgar Allan Poe, whose poor finances — he was paid just $9 to write “The Raven” — meant he was constantly on the move. An elegant five-story townhouse at 116 Waverly Place sold in October 2016 for $21 million; the listing, naturally, proudly touted it as the location of “The Raven’s” debut. While the address is correct, the building is not. The current house replaced the one where Poe hung out. According to John Strausbaugh, an expert on the Village’s history, Poe’s connection to the 1831 Northern Dispensary — the triangle-shaped building across the street at 165 Waverly Place that served as a low-cost health clinic — is shaky, too. (Since converted to apartments, the most recent pad to rent there, a one-bedroom, asked $3,695 per month.) Even worse, back in 2000, NYU tore down Poe’s only verified Village home at 85 W. Third St. and replaced it with an ersatz, poorly executed copy in the wrong location that is part of the law school’s Furman Hall. 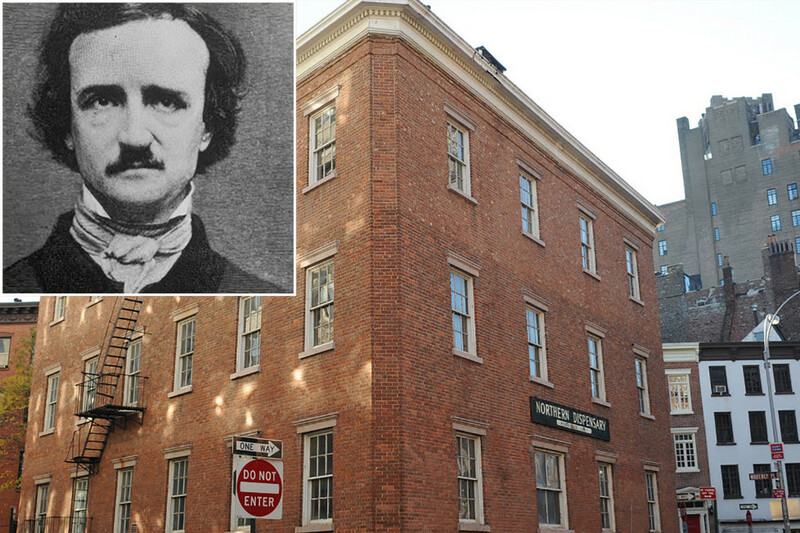 It’s ironic that Poe is said to haunt the Village — but his actual haunts are gone. Still, not every building’s great backstory is fabricated. Walk east on 11th Street to No. 217 and the townhouse of Dore Ashton, the renowned art critic who championed the 1950s and 60s group of writers, painters and performing artists called the New York School, as well as the work of Mark Rothko and other abstract expressionists. (Her avant-garde views allegedly got her fired from the New York Times.) Ashton passed away in January at the age of 88. Ashton’s house, which is about go on the market for $4.5 million with Corcoran’s Paul Kolbusz, Sara Gelbard and Melissa Sargeantson, was known for raucous dinner parties, where guests were allowed to talk for just 10 minutes before being required to spend the rest of the evening dancing. According to Ashton’s daughter, Paris Marina Devereaux, at one dinner in about 1973, Andy Warhol did an impromptu performance piece during which “an axe was plunged through a blank canvas,” narrowly missing Devereaux’s grandmother’s head. Besides Rothko and Warhol, other frequent guests included drip pioneer Jackson Pollock, painter Robert Motherwell and cartoonist Saul Steinberg. Like Leland Chumley, Ashton would hold secret political meetings in the house; Devereaux grew up aware of tapped phones and blindsided by occasional FBI sweeps. In the end, perhaps it doesn’t much matter to sellers or buyers whether the fables of yesteryear are proven or not. Whether a house is steeped in real history or urban folklore, one thing is certain: If you like a good story, the Village is the best neighborhood for you.